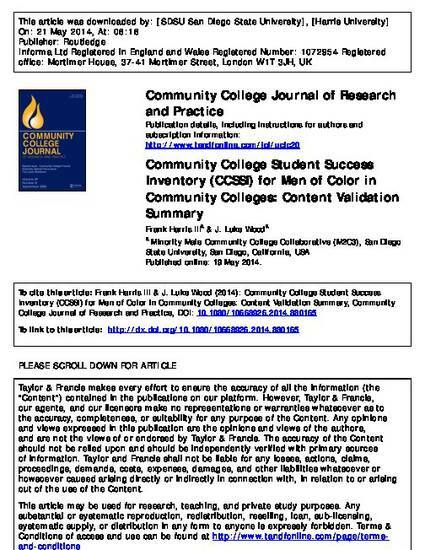 This study reports on the content validation of the Community College Student Success Inventory (CCSSI) for Men of Color. The CCSSI was designed to be used by community colleges to assess their effectiveness in addressing success outcomes for men who have been historically underrepresented and underserved in education, particularly men of color. A panel of subject matter experts (SMEs) rated the instrument and provided qualitative feedback on additional areas for consideration. Content validity index (CVI) and scale level index scores (S-CVI) are reported. The instrument illustrated strong CVI and S-CVI scores. SMEs suggested several additional areas for consideration that were added to the CCSSI. The instrument is recommended for use by community colleges interested in enhancing outcomes for men of color.